Last week I promised you a roundup of F1 podcasts (after all, IPL and Formula 1 are the catchwords of the season.) It’s a shame there were no elections podcasts happening during our voting season, but oh well! Next time, right? Well here are the most popular F1 racing audio broadcasts that you can take with you on the road — just remember, you are NOT Michael Schumacher. One of the best podcasts comes from sidepodcast.com (on iTunes or another aggregator search “Sidepodcast” or “F1”). BBC’s Radio 5 “Chequered Flag” showcases pre-race practice and race commentary as well as post-race analysis. A PG-13 rated podcasts also comes from The Formula Pod (search “Formulapod”). There are a dozen more to choose from. If you’re a Renault fan — check out their official team podcast. How long do you think before Force India has one as well? For the non-race fans, maybe a little self-check? ABC Radio has “Health Report” that you can listen to news and reports from around the world about mental and physical health. In this magazine-style show, learn what science is telling us about depression, weight loss, and even how long one should chew a raisin. “Health Check” from the BBC is topical and very short, and includes stories from India. It’s the kind of stuff *I* wish radio would broadcast in India but in the absence of which — we have podcasts! Remember you can find these podcasts in several different ways: by searching topic, title or author in iTunes or aggregators like podcastalley.com or odeo.com — or simply by searching through an engine like Google. Then you click on the download or subscribe button or paste the podcast feed URL into your receiver, such as Juice or iTunes. Once it downloads to your computer, you can listen at your desk or transfer the audio file to your portable device — whether it’s your phone or your mp3 player. Tip: If there’s no url with the title, just pop the keywords into the search or description field of the directory. Next week, we’ll round up parenting podcasts. Meanwhile, if you have podcasts you love and would like to share, please write in. 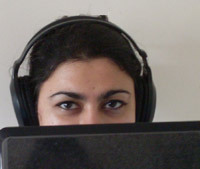 Feel free to send topic suggestions for podcast recommendations or any questions to chhavi AT sonologue.com. To get your programme, you need first to find it in a directory and then download it using what’s called an aggregator — a site or program that pulls the shows into a common place. One program that does both these things is iTunes — it’s a directory as well as an aggregator. If you don’t have iTunes, you can use Juice, Podomatic, Podcast Alley, Odeo, and a plethora of others. I recommend iTunes or Juice for ease of use. Once you’re in a podcast directory, you can simply type a keyword in the search field and then click on the “subscribe” field next to the one you want to listen to. It will show up and update itself in your podcast aggregator. Then you can either listen right there, or you can sync up your mp3 device – your Zune/iPod/Creative or even your phone. Download it as an mp3 file and … voila! You’re good to go.